If you are looking for a unique way to provide your guests with high quality and beautifully prepared food, a hog roast feast is the way to go! Primed by our professional chefs and served up by our highly experienced serving staff, Hog Roast North London can provide you with a fantastic spread that will keep your guests talking long after your event has passed! Our professional attitude impresses our clients each and every time and you can be assured that your event will pass without a hitch with the help of Hog Roast North London. With our years of experience, we can cater for any type of event, no matter how big or small it is. We have catered all types of events from small personal family get-togethers to large wedding celebrations. We can even cater for corporate business functions if that’s what you require. From start to finish, we will look after every aspect of your catering requirements including side dishes to complement your food and drinks also. For over 10 years, weddings have been our particular lity, so much so that we view your big day as our big day. You can impress your guests with our amazing selection of foods that you can personally select from our range of wedding menus. The food at your wedding is one of the most important elements of the day and with our selection of hog roasts, we guarantee to provide a fantastic feast for all of your guests. If you wish to try your hand at roasting your very own hog, Hog Roast North London can make that dream come true! We will provide you with everything you need including a state of the art hog roast machine and a gas bottle and we’ll collect everything from you afterwards. 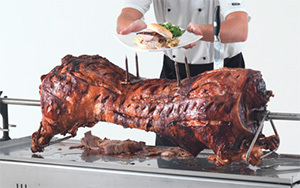 We can tailor your hog roast machine hire package exactly to your needs and your budget. Contact us today and let us know what it is that you require and we can get started on addressing your catering needs in no time at all!